I waited to post this until the British heir to the throne safely entered this world, so as not to draw attention from that monarch-to-be. But here’s another royal event, the jazz coronation of Howard Miyata as Musician of the Year on March 2, 2013, at Dixieland Monterey / the Jazz Bash by the Bay. His regal attendants include Susie Miyata, Gordon, Brandon, and Justin Au (nephews three), and the High Sierra Jazz Band, with special commentary by Pieter Meijers and Bryan Shaw. Where HAIL TO THE CHIEF meets TIGER RAG, and where “catcalls” are a good thing. Congratulations to Uncle How! All good things must come to an end, so here (with regrets) are the last five performances from a magical evening of music. George Esposito (georgeespo@sbcglobal.net) — well-known on KXJZ Sacramento public radio as a jazz host — has been staging lovely outdoor concerts for a long time: this is the ninth year of his Midweek Sunset Jazz Series. Email him to get on his mailing list for future concerts. On June 6, 2013, I and a large crowd enjoyed a singular concert in George’s spacious backyard, where the music was presented against the changing canvas of the sky, as afternoon shaded into night. And the music mixed sweetness, inventiveness, and surprise. The creators: Tamar Korn, song; Gordon Au, trumpet / composition / arrangement; Dennis Lichtman, clarinet; Jared Engel, string bass; Jimmy Spero, guitar. And, on the final two tunes, the Au Brothers leaped in — Justin, trumpet; Brandon, trombone. The repertoire: three classics; two originals by Gordon (one with lyrics I’d not heard before). Readers of JAZZ LIVES know Gordon Au (youthful brass Maestro / composer / arranger / occasional vocalist) but may be less familiar with his gifted younger siblings — Justin (trumpet) and Brandon (trombone). They’ve played jazz festivals as the Au Brothers Jazz Band, keeping family ties strong with the addition of Howard (Uncle How) Miyata on tuba. Friends who round out the band are guitarist / banjoist / vocalist Katie Cavera and swing percussionist Danny Coots. On paper, especially for those used to the “traditional” line-up, this combination might look unorthodox, but it works beautifully. I can prove it! 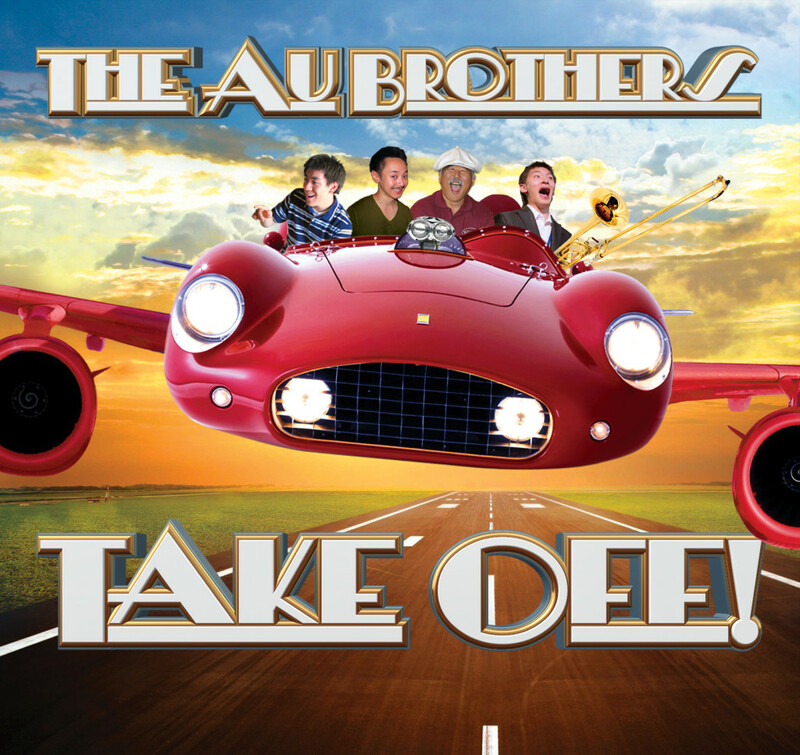 They’ve just released their debut CD, aptly called THE AU BROTHERS TAKE OFF! (with witty art by Molly Reeves of the Red Skunk Gipzee band, and characteristically literate liner notes by Gordon). The CD features a few chestnuts given new life — JELLY ROLL (with a vocal by Uncle How that is reminiscent of a good bakery) and LIMEHOUSE BLUES, several songs from a century ago — WHEN FRANCIS DANCES WITH ME (vocal by the choreographic Katie) and CENTRAL, GIVE ME BACK MY DIME (a song new to me but one that gives Brandon an opportunity to rail at the limitations of the “new” technology when it’s involved in romance) — and originals by Gordon which show his range from wooing to hilarious, from swing to comedic grotesquerie: PISMO BEACH PARADE, STINKY FEET BLUES (not what you might expect), CAPITAL-BOUND, HOW COULD I SAY THAT I LOVE YOU, TANGO OF LOST LOVES, BROOKLYNBURG RAG — and a wonderful collage of themes from jazz classics, BIG CHIEF DADA’S AXE OF PLENTY STRAIN. The interplay between the horns is marvelous; the rhythm section rocks, and the whole enterprises sits comfortably somewhere between the Hot Five, Gil Evans, Tom Lehrer, and Spike Jones, the balance shifting from song to song. You can find out more about the band (their schedule of future appearances) and the CD here, and the Brothers have generously posted many videos of the band on this site. I will take this opportunity to add to the Brothers’ video hoard — for current watchers and future generations as well as life forms on other planets who might be vibrating to the gigabytes in interstellar space — with some engaging evidence of the ABJB in action at the 2013 Jazz Fest by the Bay in Monterey, California. Gordon’s casual wardrobe was especially arranged by American Airlines’ baggage handlers. I’m happy, excited, bewildered, and reaching for the oaktag and the colored Sharpies. No arts and crafts project is on the horizon, but Dixieland Monterey’s JAZZ BASH BY THE BAY has just published its 2013 schedule. This moment is always a combination of elation and puzzlement. “Are all my favorite bands playing or am I dreaming?” to quote a late-Thirties record. Yes, there’s John Sheridan and Jeff Barnhart, Carl Sonny Leyland and the Au Brothers, High Sierra, The Reynolds Brothers, David Boeddinghaus, Banu Gibson, Katie Cavera, Marc Caparone, Eddie Erickson, Sue Kroninger, Danny Coots, Howard Miyata, Pieter Meijers, Allan Vache, Bob Draga, Ivory and Gold, Jim Fryer, Titan Hot Seven, John Cocuzzi, Virginia Tichenor, Marty Eggers, Ivory and Gold, Frederick Hodges, We 3, Jerry Krahn, Ed Metz, Paul Keller, and more . . .
We should all have such problems. Plot out your perfect weekend — including dance lessons and a Thursday-night concert by We 3 (Barnhart, Coots, Draga) to kick things off properly. Try it for yourself. You have seven weeks to calculate the possibilities that will bring the most joy. But you can do it! And I’ll see you in the Portola Room, or the De Anza, or the Bonsai . . . look for me and say hello! Posted in "Thanks A Million", Bliss!, Generosities, Hotter Than That, Ideal Places, Jazz Titans, Pay Attention!, Swing You Cats!, The Heroes Among Us, The Real Thing, The Things We Love, Wow! Who says that hot jazz is solely the purview of a generation of elder statesmen? Certainly not the young brassmen Justin (trumpet) and Brandon Au (trombone), who paid a social call to the High Sierra Jazz Band at the Sacramento Music Festival on May 27, 2012. Justin and Brandon joined leader / reedman Pieter Meijers, their Uncle How (Howard Miyata on trombone and vocal), Bryan Shaw on trumpet, Stan Huddleston on banjo, Bruce Huddleston on piano, Earl McKee on sousaphone and vocals, and Charlie Castro, drums — for a program of hot cross-generational jazz and hijinks. Age doesn’t matter in jazz if the spirit is right.